The nation’s slow recovery from the “Great Recession” has been especially difficult for young workers, with many of those under age 25 remaining “idled”—out of work and out of college—a new report says. That analysis, “The Class of 2014,” was published by the Economic Policy Institute and examines the labor market before, during, and after the deep economic downturn, which officially ended about five years ago, in mid-2009, but has cast a long shadow since then. One of the central arguments in the paper is that there are few signs that young adults have been able to find “shelter in school” from the job losses and other negative economic effects of the recession. Enrollment in postsecondary education did not increase between 2007 and 2012 at rates that were greater than pre-recession rates. And during the more recent period of recovery, since 2012, college enrollment has actually dropped significantly, according to the institute, a Washington think tank that describes itself as advocating for low- and middle-income Americans. The authors point out that that unemployment of young graduates is high today “not because of something unique about the Great Recession.” Young workers always struggle finding jobs during weak labor markets, they say. It just happens that the Great Recession is the worst economic period since the Great Depression. There are about 1 million “missing” young workers—defined as those under age 25—in today’s economy—those who are not employed and not actively seeking work meaning they’re not counted in the unemployment rate. If those missing individuals were in the labor market looking for jobs, the unemployment rate among those in that age group would be even higher, 18 percent, than it actually is today, at 14.5 percent. The institute authors argue that several policies could improve the economic prospects for young workers. Those steps include re-establishing public-sector jobs cut during the recession; work-sharing, which they say would encourage employers to keep more workers on the payroll; and allowing early entry into Social Security and Medicare for older workers wanting to retire early, which would decrease the labor supply while holding demand for labor steady, leading to a decrease in unemployment. 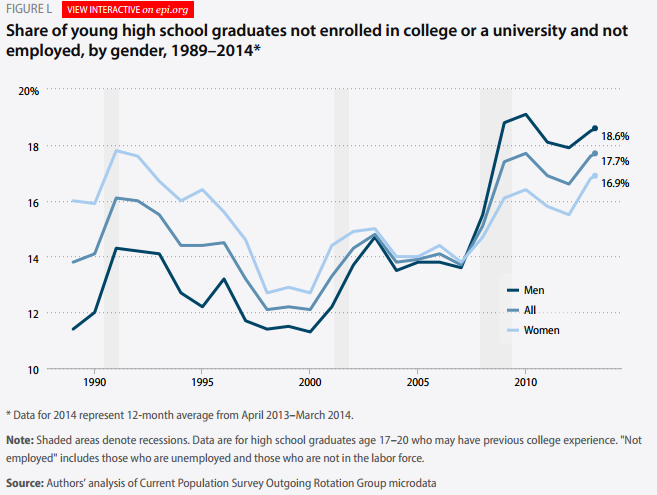 [UDPATE: Heidi Schierholz, an economist at the Economic Policy Institute and an author of the report, said that overall, the potential consequences of young people “idylling” between work and postsecondary education can be great, particularly because obtaining a college degree tends to boost earning potential over students’ lifetimes. At the same time, there are also troubling signs that assumptions about the value of a degree have not held up in recent years, she noted. Wages among college graduates have roughly stagnated over roughly the past 10 to 15 years, Schierholz said in a call with reporters on the report’s findings. The best cure for that stagnation is for policymakers to support policies that lead to strong job growth and increase employers’ demand for workers, she said.